With the seasonal calendar working its way into the winter months, many turn to their homes for their source of entertainment in a warm, comfortable setting. Times have moved on from playing DVDs through old tube televisions. Larger LCD televisions, blu-ray players and now ultra and high definition formats give users a taste of the movies at home. Let’s face it, sometimes it’s easier not to have to book tickets, get dressed up and drive to the closest cinema complex. But at home you never really get a real taste of the big picture… or the big sound to go with it. For those after a serious movie experience at home, you can have your cake and eat it too. All you need is, well, a dedicated room. “Easy for you to say!” I hear, but converting that rumpus room or shed can not only add value to your house, but also bring the next level of entertainment to your family and friends on a cold winter’s night. If you’re looking to build, many new house designs are starting to include home theatres on the plan – just add a couple of extra metres to the plan (they normally make them a tad small!). Where to from here? Well, imagine having your whole front soundstage already done for you. That’s left, centre, right and two (yes, two) subwoofers. Enter Krix Series MX. 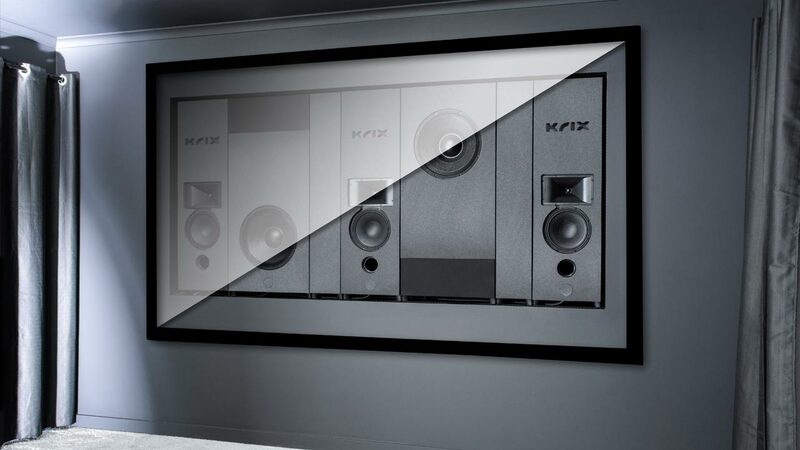 Employing the same technology and components you’d find in our commercial cinema speakers, the two Krix MX systems will give you true cinema sound. Efficient, powerful bass drivers and our Krix designed horns and waveguides will give you the direct cinema sound that you previously only used to get at the movies. A huge dynamic range means everything from a leaf rustling along a path to a full blown aerial assault will be delivered with a power, clarity and control that can only be believed until you’ve experienced it. It’s that good. The MX range utilises the concept of the infinite baffle wall, something cinemas have been doing for years. With acoustically absorbent material built-in across the front baffle, it’s ready to go out of the box – opening up the soundstage and improving imaging. Cars will roar from left to right with amazing precision and depth of field. The latest flurry of superhero movies will never sound the same! You’ll want to re-visit your Batman collection all over again… well, the Nolan ones anyway. Already pacing out your rumpus room? The modular system makes installation and wiring a breeze. The only downside is that once installed, you don’t get to look at it often. But there lies the beauty of an acoustically transparent projector screen; the sound projects through the image the same way as your local cinema. When your favourite movie star talks, it comes straight from their mouth. When a spaceship takes off, it literally launches right through the screen. Now imagine Friday movie nights – sitting down to a movie with family and friends in your own home cinema – except this time it truly is like being at the cinema.